Some of the items available at the market! clockwise from top left: Greeting cards by aricoco, necklaces by Katie cercone/go! 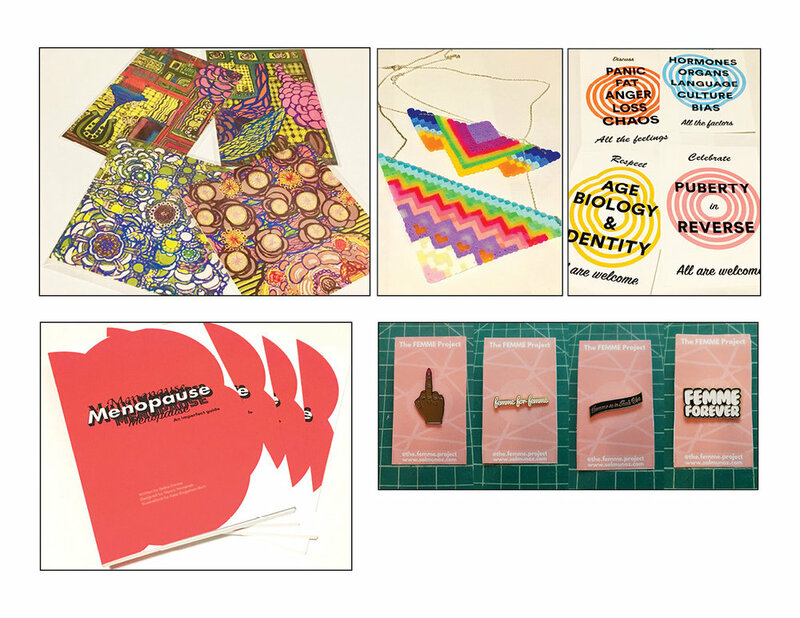 pushpops, postcards and booklet from the M_______pause project/nancy nowacek, and fierce femme pins by Sal muñoz. For ten years, Culture Push has supported the work of over 40 artists, and we’re excited to bring them to DPA. Fellowship Alums Nancy Nowacek, Chloë Bass, Sal Muñoz, Sarah Dahnke/Dances for Solidarity, Sonia Louise Davis, aricoco, and more will be vending pins, t-shirts, books, zines, greeting cards, talismans, and a slew of one of a kind items, most of which you can’t find anywhere else! Come meet our staff and our artists, and support the work of our network of do-gooders/makers/thinkers/and Culture Pushers all under one roof.